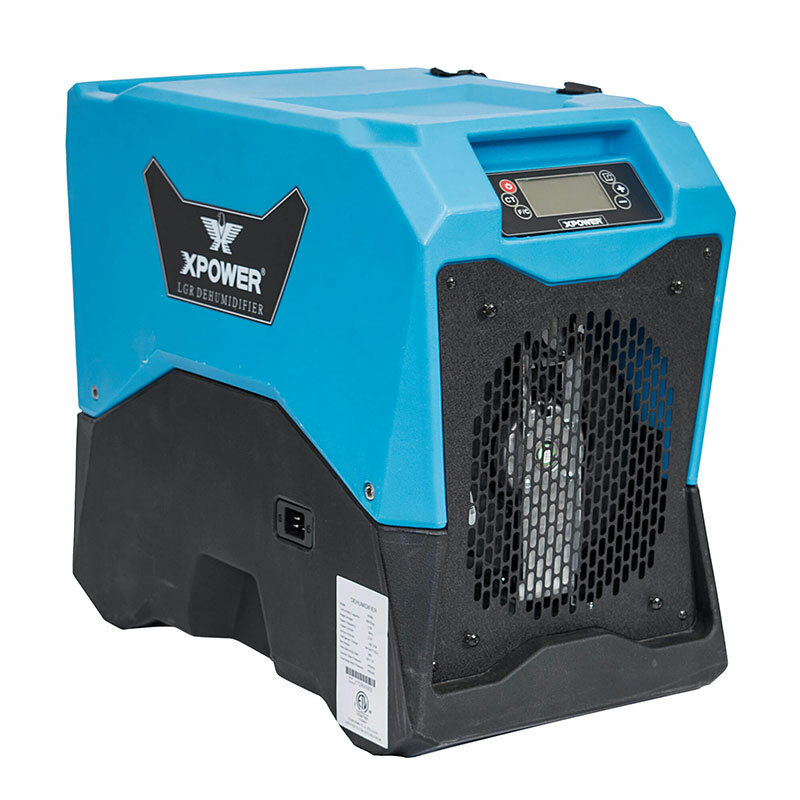 XPower XD-85L LGR Dehumidifier Low Grain Refrigerant is developed to excel in the toughest water damage restoration environment. 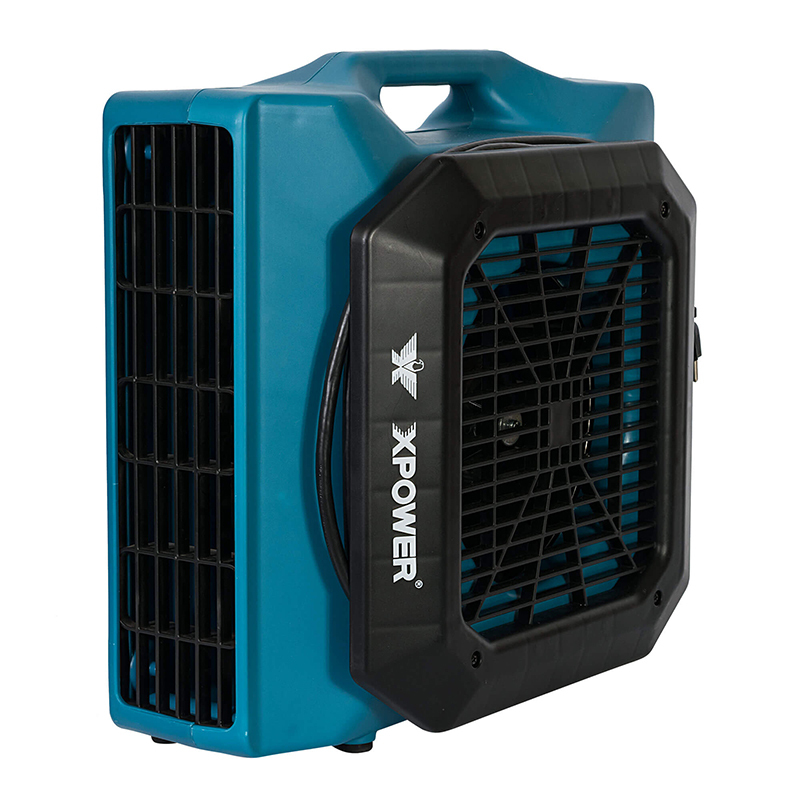 This professional grade XPower LGR Dehumidifier extracts more moisture than much larger commercial models. A user friendly digital control panel monitors your job site's current humidity and records operating time. Features Dual Intake Technology which boosts efficiency and performance in a wide range of operating conditions. 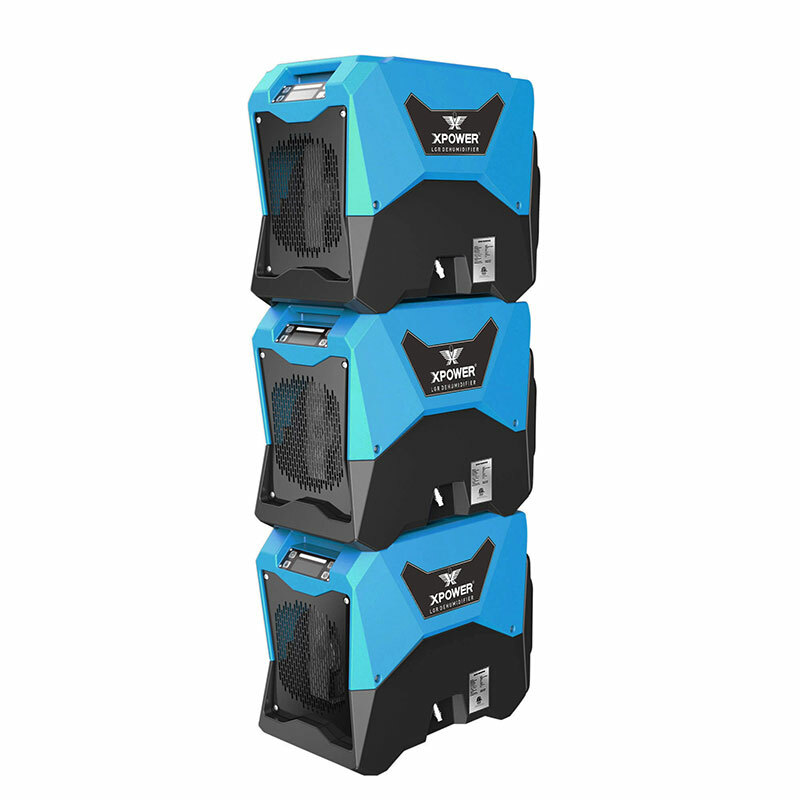 It is designed to maximise storage space, these compact units stack up to 3 high and features 2 molded handle grip points on the front and back. A separate model including wheels and is also available for added mobility. 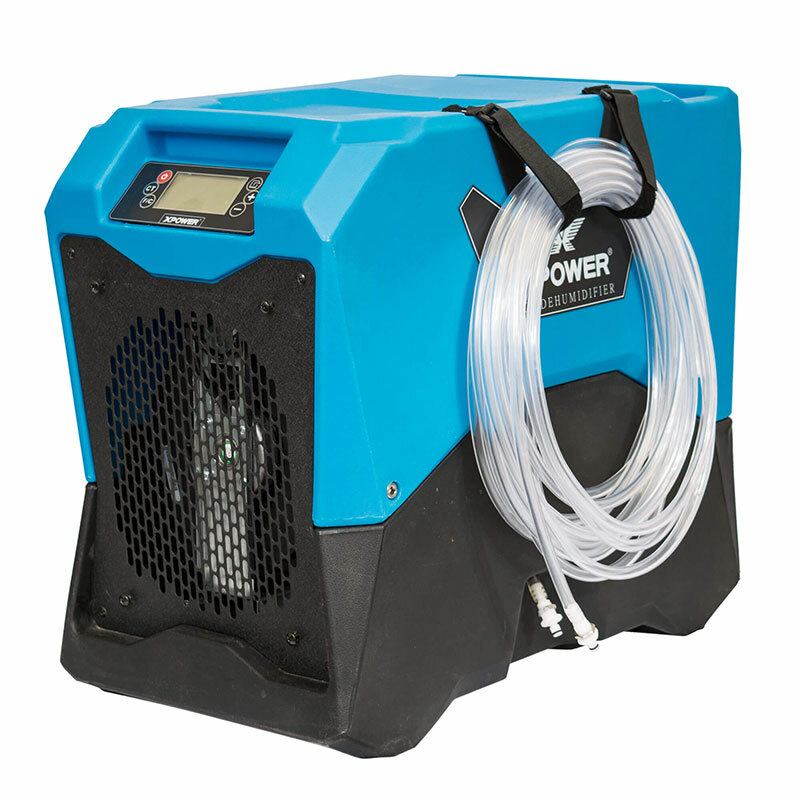 It also features an auto purge pump with drainage hose that automatically purges when full, eliminating the task of monitoring collection tank levels. Easy to move tilt handle. 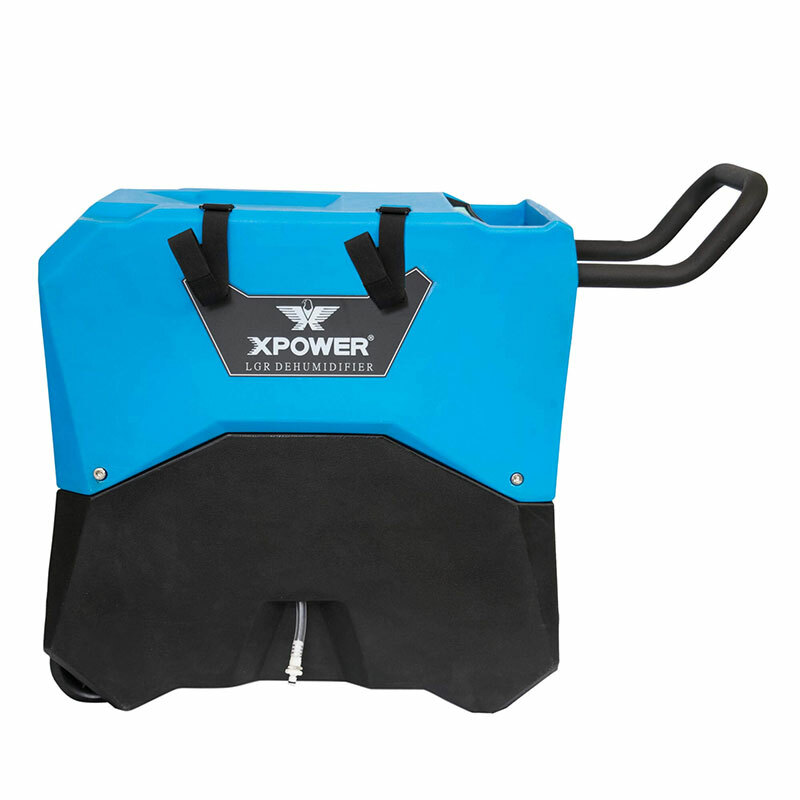 XPower Pl-700A Professional Low Profile Air Mover is compact, lightweight, and has ergonomically positioned molded handle, and is made from durable and rugged polypropylene housing, featuring a powerful ventilation. 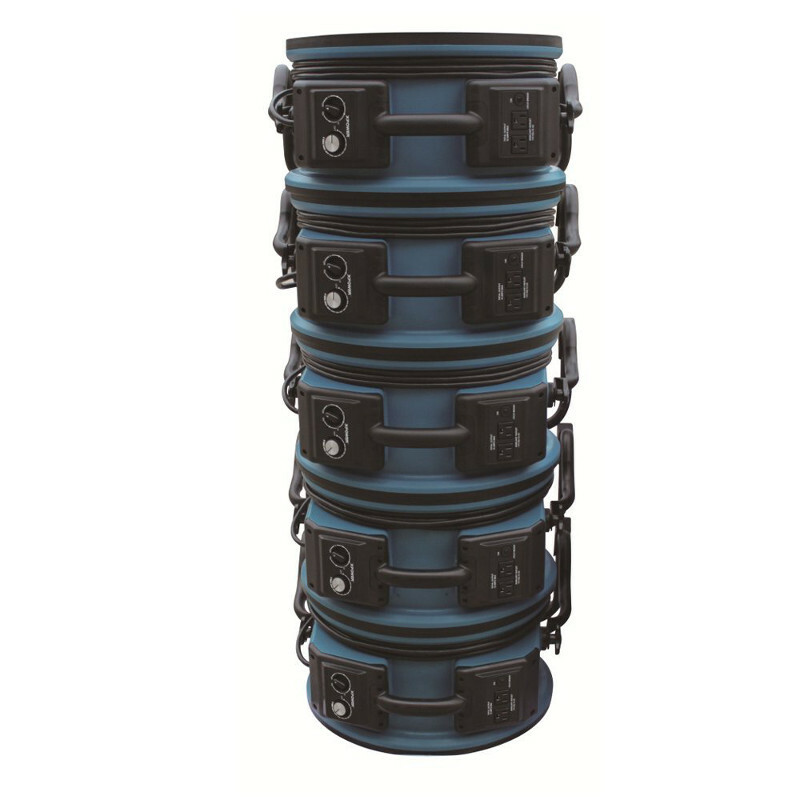 It can operate and store vertically or horizontally. A 1/3 HP motor and large intake area generate a high volume of extended airflow which has the velocity to maximize drying area efficiently. 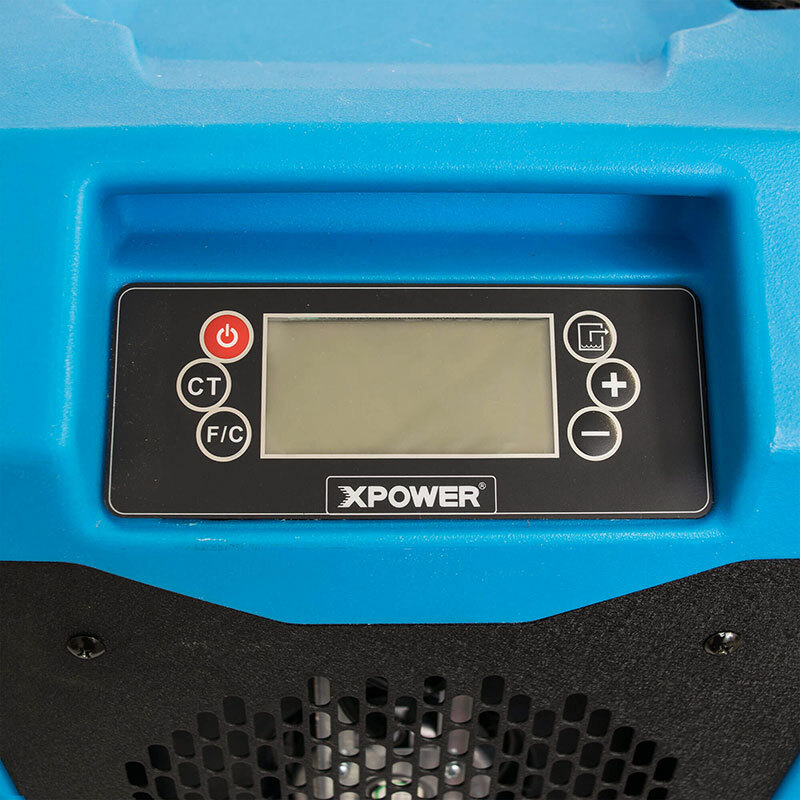 It features three speed switch and comes with a built-in power outlet for daisy chaining which will allow an additional six (6) of the same units to run on one circuit at the same time. 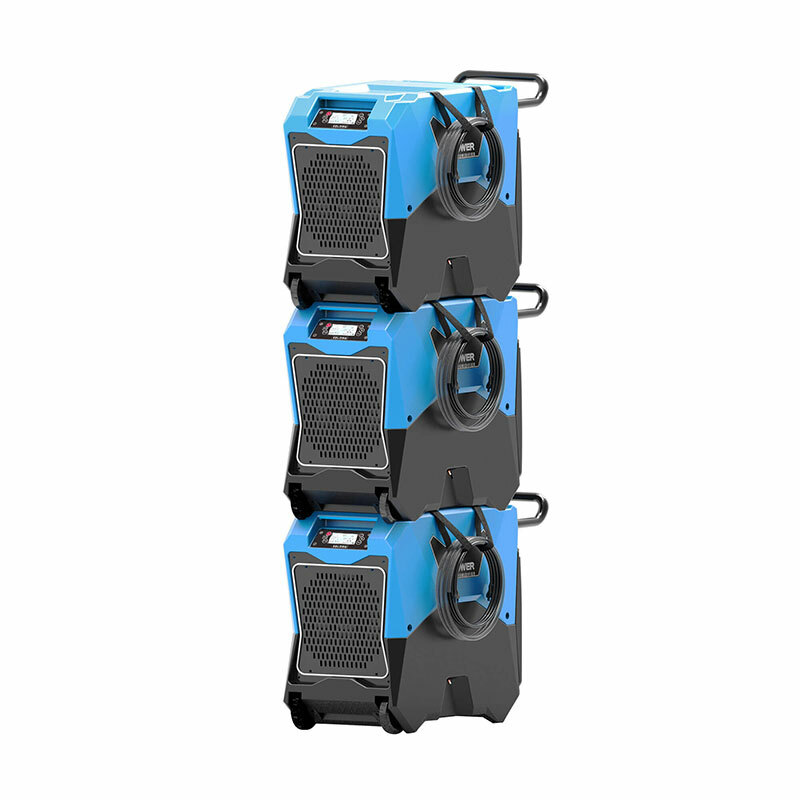 Other features include wrap around cord design, non-slip rubber feet, quiet performance. Strategically placed vents on the underside of unit dry surface below the fan. 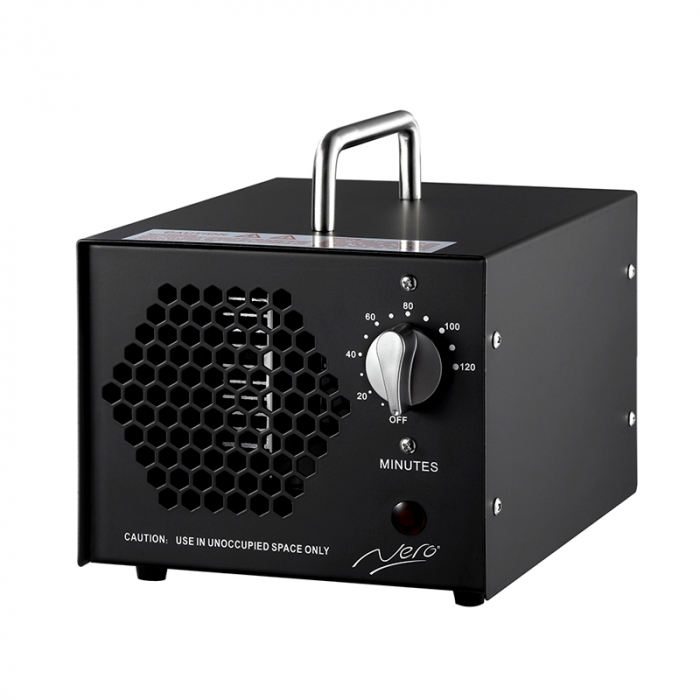 The ActivO ozone generator from Dri-Eaz allows you to safely and efficiently removes odors from smoke, mold, mildew and sewage, allowing rooms to be turned around quickly. It features both an activation cycle and a unique fully automated deactivation cycle. 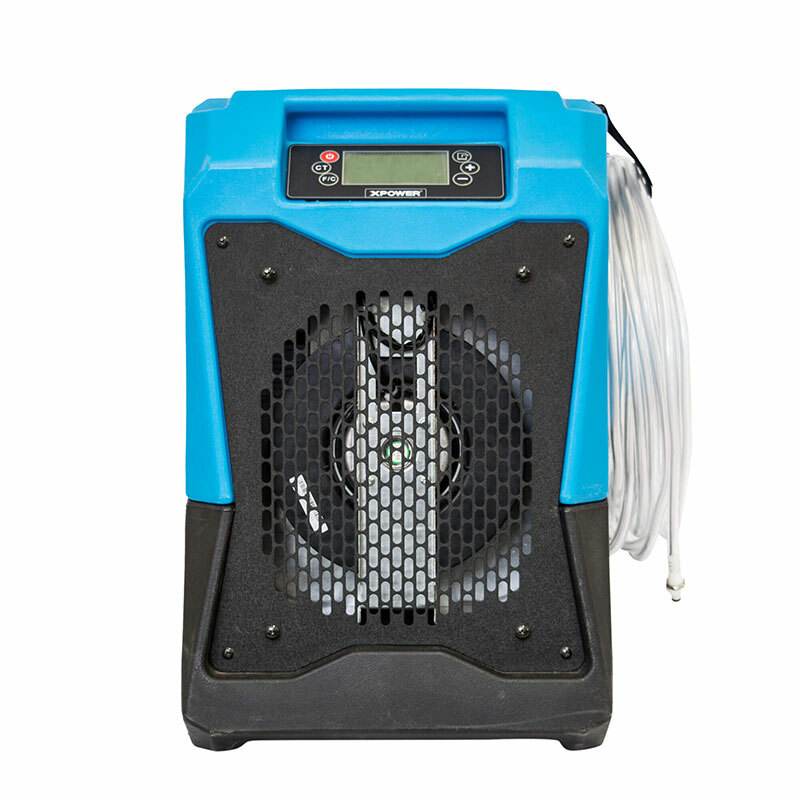 This patented technology quickly achieves a very high concentration of ozone, and then converts the ozone back into pure oxygen which makes it safe to return to the area. 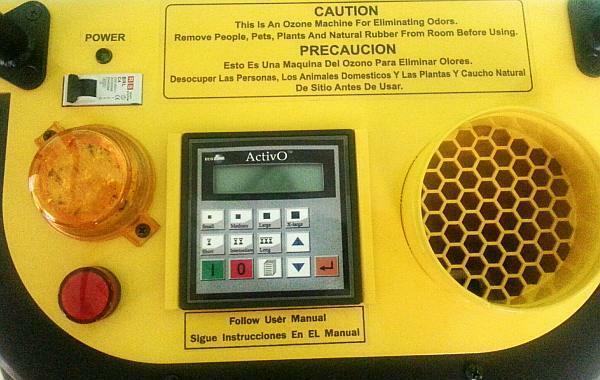 A bold flashing light provides a continuous alert that ozone is being generated. When the light goes off, the odor is gone - and so is the ozone. 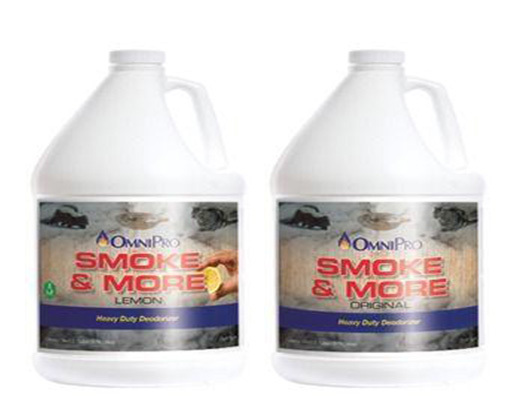 OmniPro Smoke and More Heavy Duty Odor Neutraliser eliminate odours from the source and destroy it. It's designed to eliminate odours created by protein, plastic and oil fires. 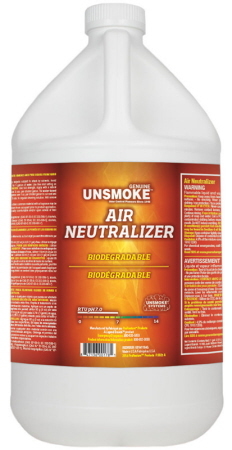 It is effective too against cigarette smoke, skunk, vomit, urine and most synthetic and organic odours. Available fragrance lemon and original. To use, you can add to existing cleaning agents to clean and deodorize in the same step at as little as 10ml/Ltr. 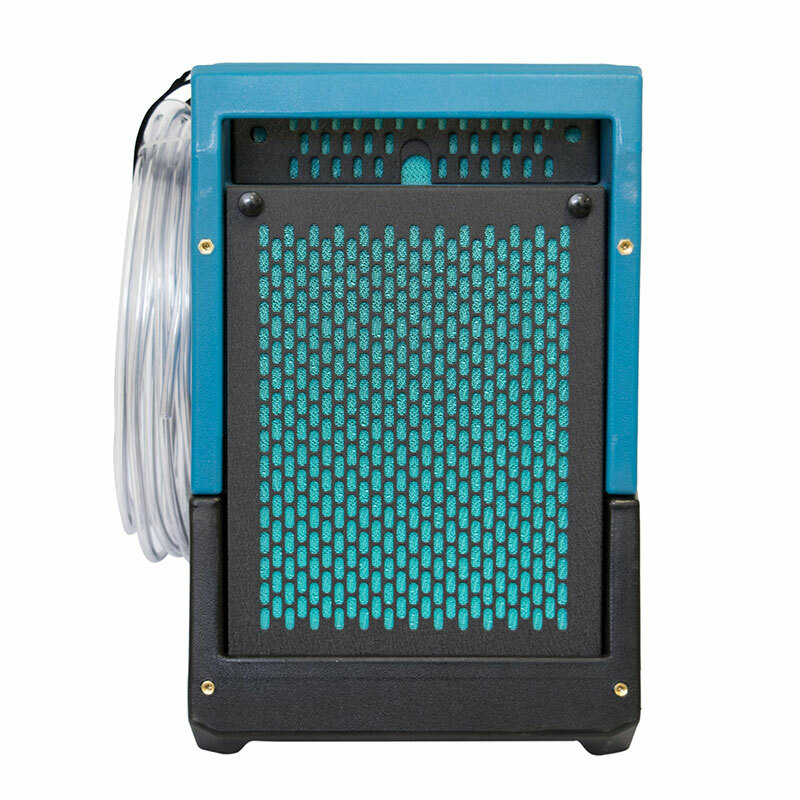 Apply through a ULV fogger at 1 part water to 1 part concentrate for broader coverage. 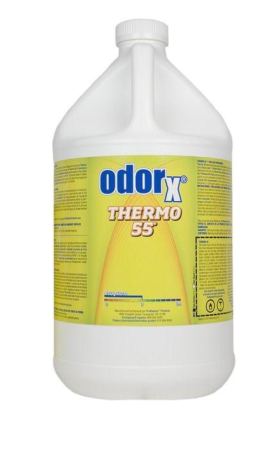 Spray and wipe on directly for severe odors diluted up to 1 part concentrate to 8 parts water. 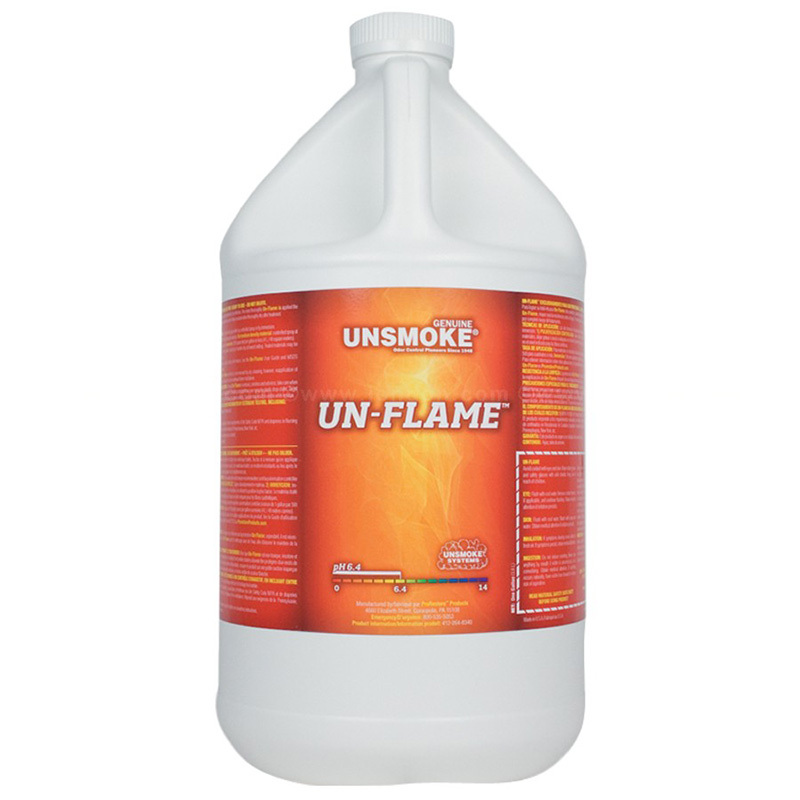 Unsmoke Unflame is a non-toxic, clear, odourless, water-based liquid designed to treat interior fabrics, such as carpet, drapes, and furniture, which contribute most to the swift spread of smoke and fire inside a home. 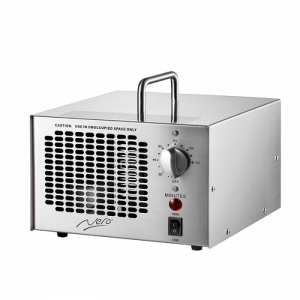 It reduces oxidation and produces a thin layer of char that stops flame spread, further combustion and actually extinguishes the fire. It can be applied to upholstery, bedding, mattresses, drapes, curtains, tablecloths, or just about any fabric item. It will also withstand dry-cleaning, but will need to be reapplied if the item is wet-cleaned. 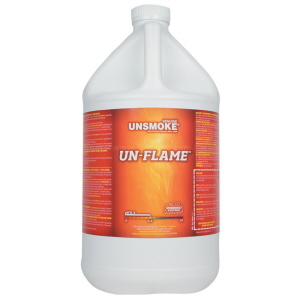 If using a protectant, apply Un-Flame first. 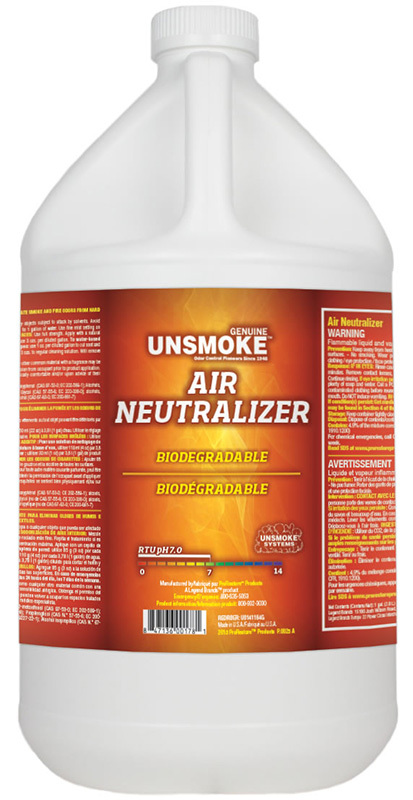 Unsmoke Air Neutraliser effectively eliminates stubborn smoke and fire odors.It doesn’t just mask the odors, it actually removes odors associated with burnt materials and smoke. Contains highly absorbent glycols. - Apply directly with a mister or add to other cleaning agents or paint for highly effective and long-lasting odor control. Odorx Thermo-55 is a solvent-based, heat-activated odor counteractant specially formulated for application using a thermal fogging apparatus. 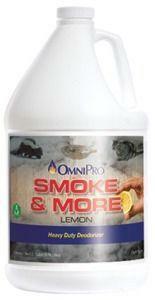 It is especially effective for controlling odors associated with structural fires. 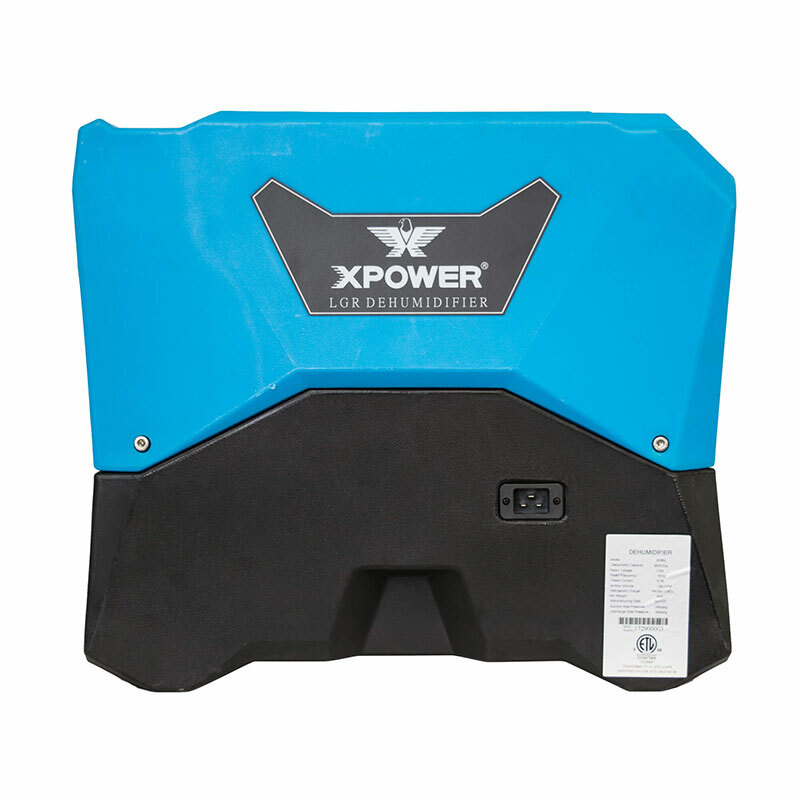 X-Power X-3400 Air Scrubber is great for high purity indoor air. 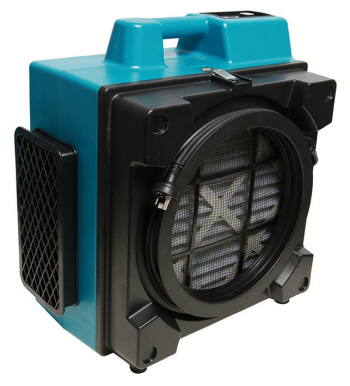 It uses a portable filtration system that draws air in from the surrounding environment and passes it through a series of filters to remove contaminants such as particles, gases, and/or chemicals. 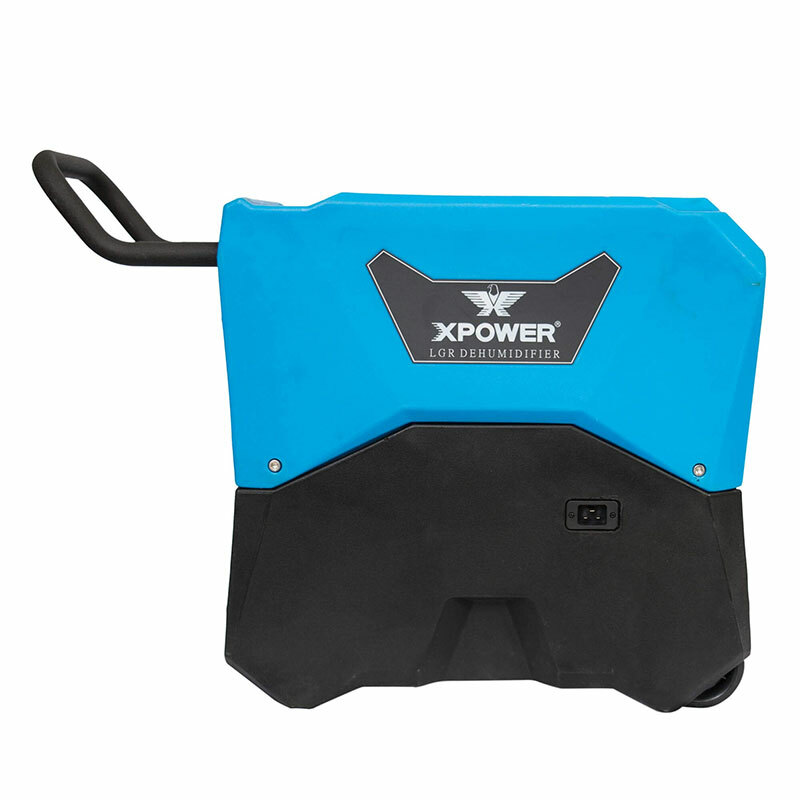 X-Power X-3400 Air Scrubber is commonly used on restoration jobs where airborne contaminants are present or will be created/disturbed during the restoration process, such as mold, dust, asbestos, fumes, etc. These hazardous particles can settle on carpet, upholstery and furnishings, or be drawn into the HVAC system and contaminate other parts of a building. Air scrubbers help protect the health of workers and building occupants by providing a clean and healthy environment. VD-65L LGR Low Grain Refrigerant Dehumidifier features "Dual Intake Technology which boosts efficiency and performance in a wide range of operating conditions. A user friendly digital control panel ready current humidity and programs desired humidity levels. 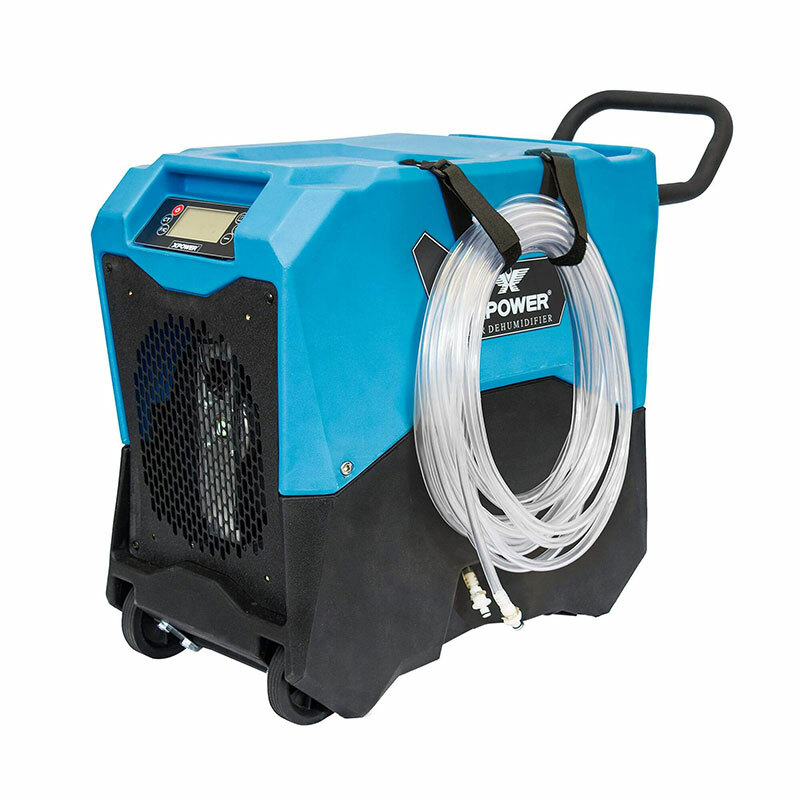 It is developed to excel in even the toughest water damaged restoration environments, the professionals grade unit extracts more moisture than much larger commercial models. It comes with metal handle and easy to maneuver wheels. 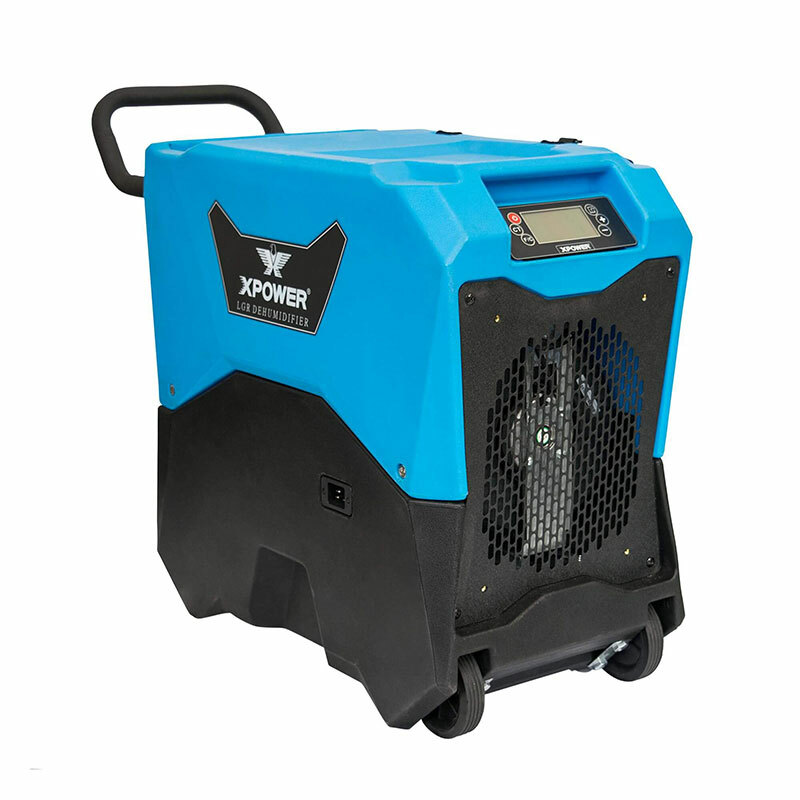 VD-85L LGR Low Grain Refrigerant Dehumidifier is developed to excel in even the toughest water damaged restoration environments, the professionals grade unit extracts more moisture than much larger commercial models. 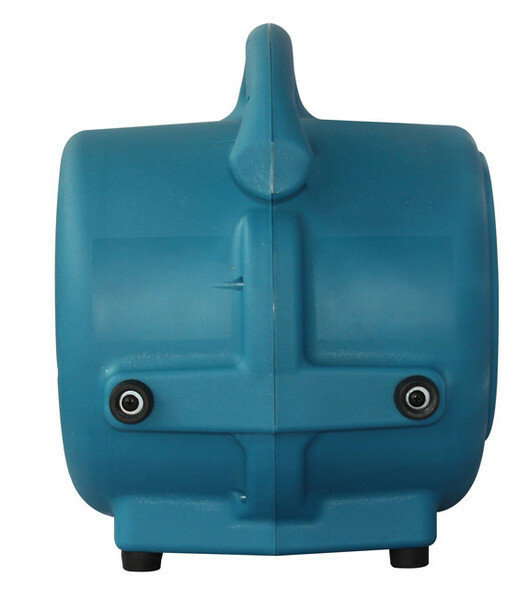 It comes with metal handle and easy to maneuver wheels. It features "Dual Intake Technology which boosts efficiency and performance in a wide range of operating conditions. A user friendly digital control panel ready current humidity and programs desired humidity levels. 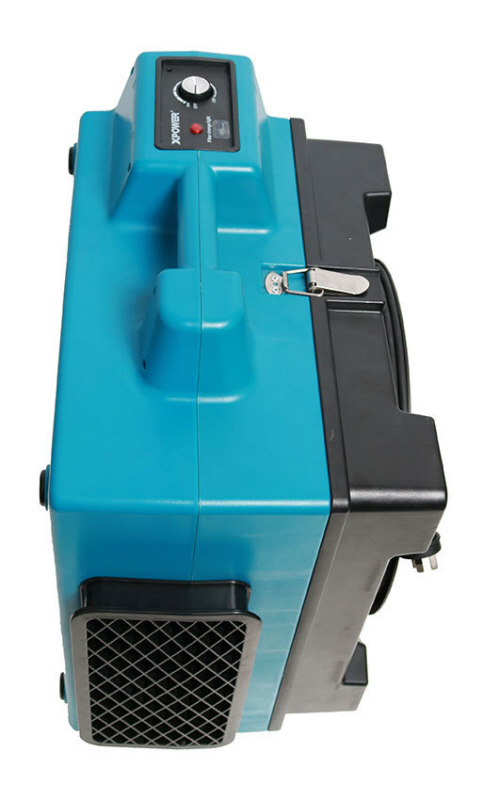 High Volume Portable Fogger 39L has two tips for generating mist and humidity that will enhance the performance of the foaming chemical. This fogger runs on compressed air. 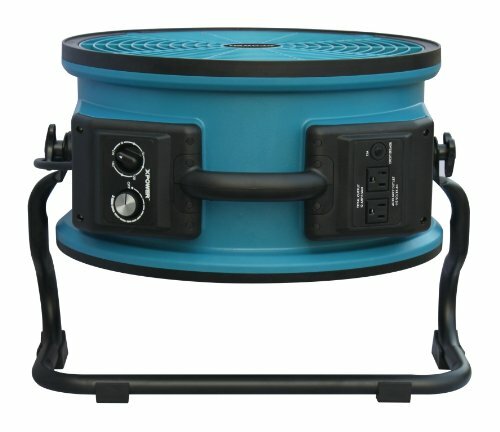 Ideal for places with no electricity. 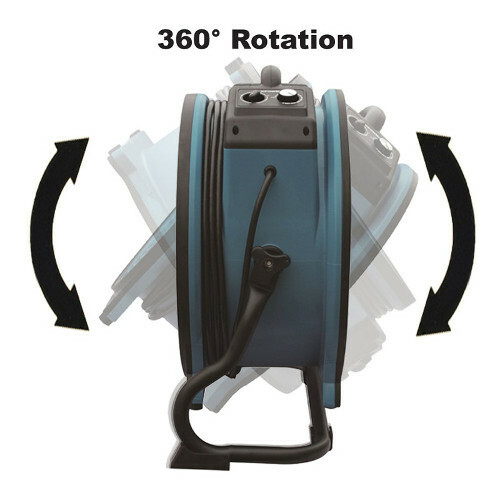 High Volume Portable Fogger 39L has three tips for generating mist and humidity that will enhance the performance of the foaming chemical. 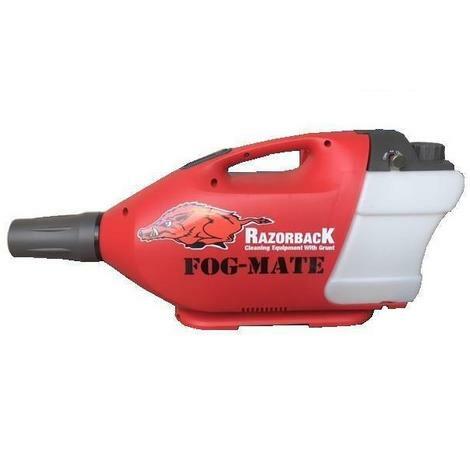 This fogger runs on compressed air. 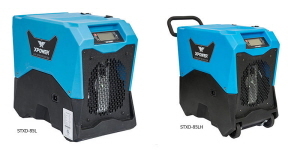 Ideal for places with no electricity. 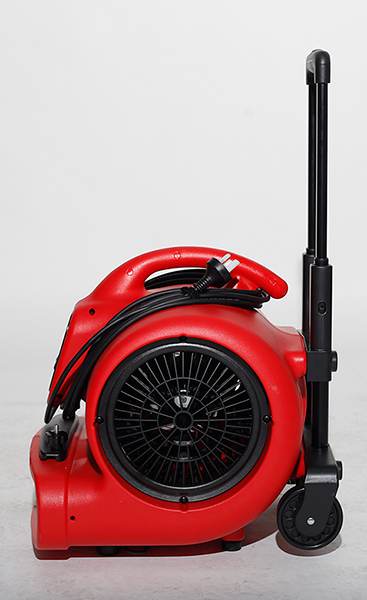 The fogger has a telescopic jets for easy access to small spaces and ceiling cavities. FOG-MATE ULV Fogger is compact, powerful, quality use after carpet cleaning to leave a lingering fresh fragrance that will wow your customers. - Use for fire and smoke restoration to knockdown odour. 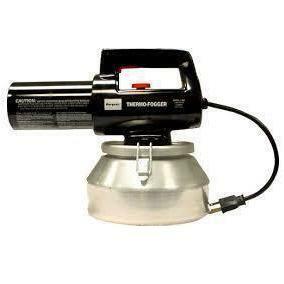 - Use to apply soot sealant to ceiling cavities and air conditioning ducts. 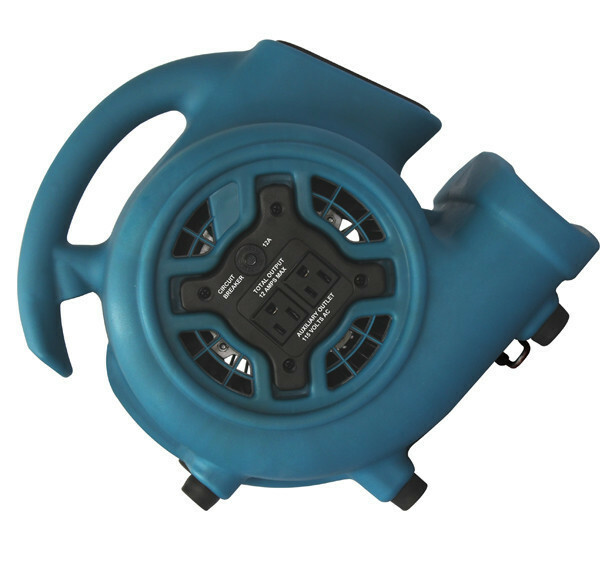 Burgess Hand Held Electric Fogger Unit tackles odor fast and efficiently. 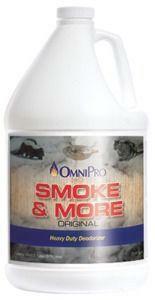 It creates a dry fog, similar in nature to the smoke created by fire and neutralizes the odour. 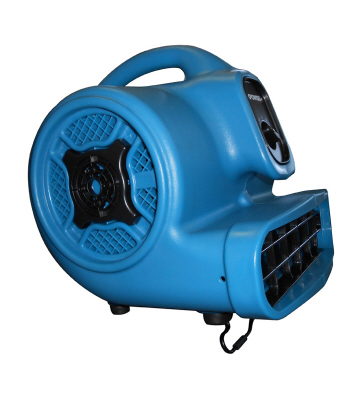 It can be used as a solvent sprayer by simply removing the heating barrel. 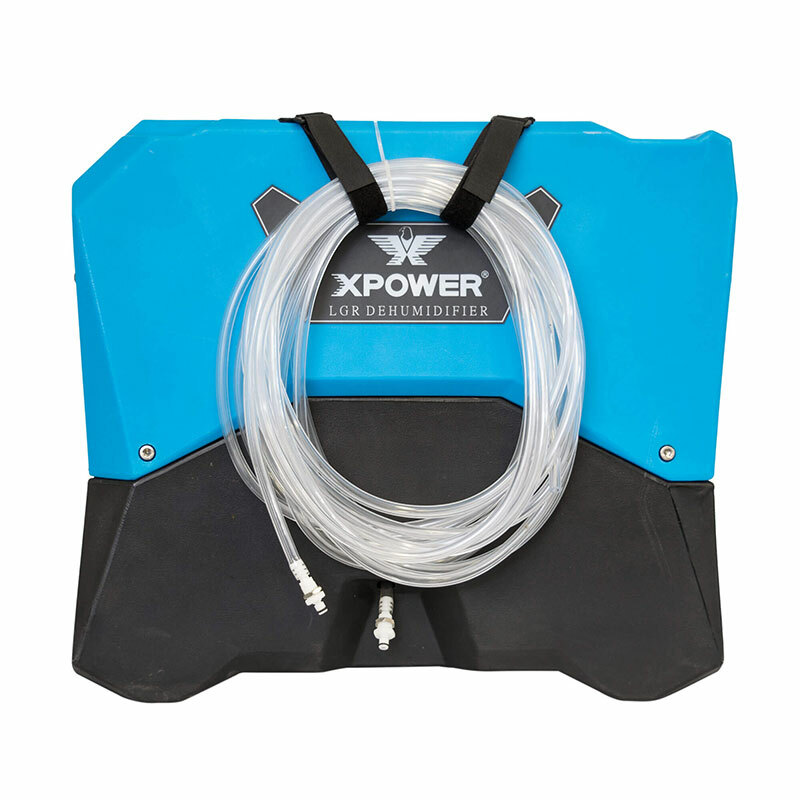 It comes with a durable aluminum solution tank. 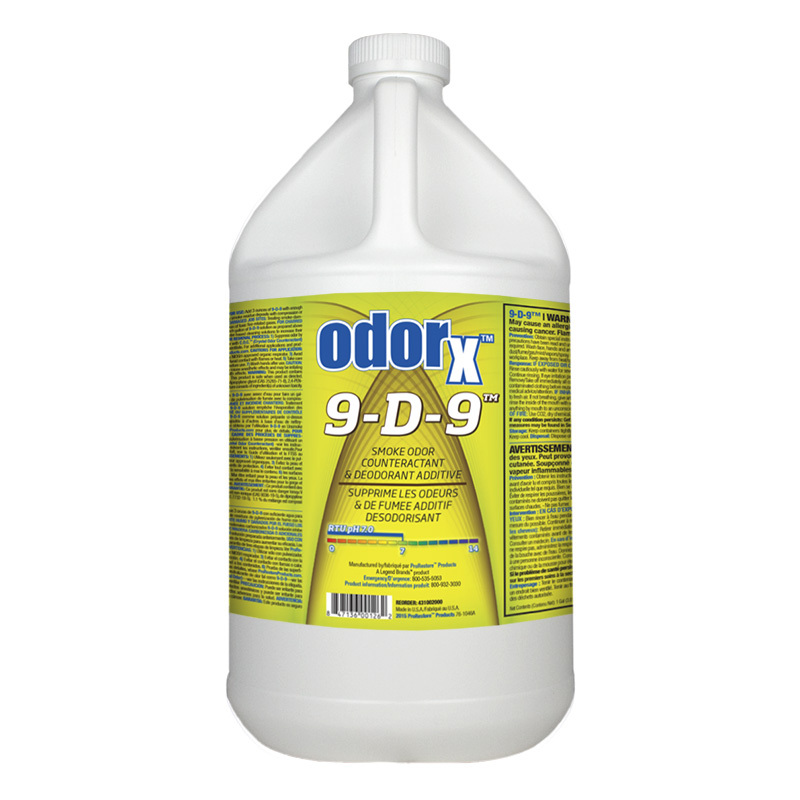 Odorx 9 D-9 Smoke Odour Counteractant is highly-concentrated general purpose smoke odour control product specially formulated to primarily remove odour from fire, smoke and other strong odors. It is blended with the finest-quality ingredients, 9-D-9 detoxifies and knocks down malodors fast and efficiently. 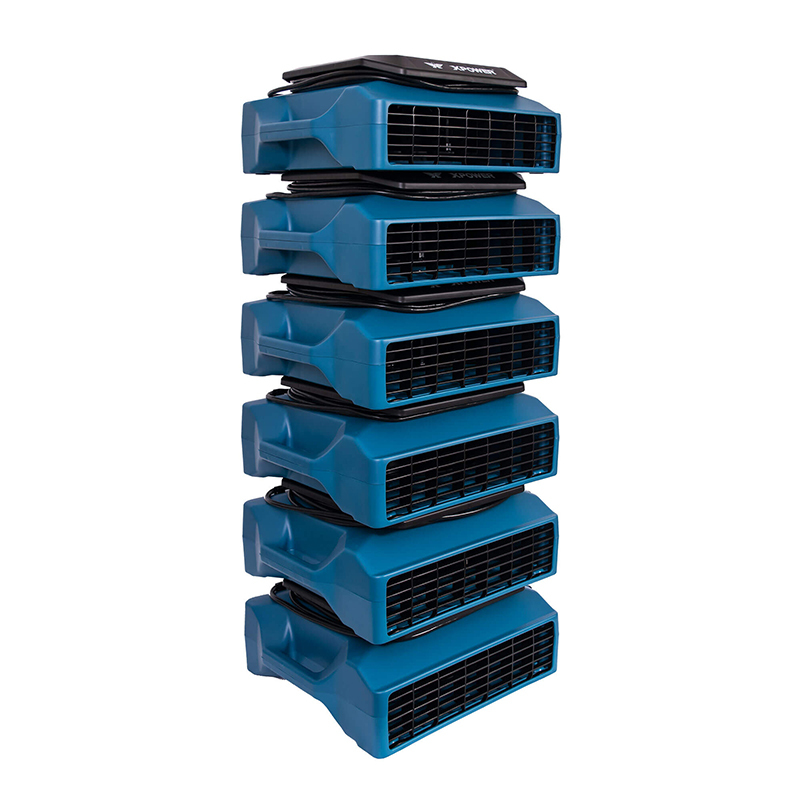 Nero 5G Ozone Machine is an affordable, powerful air purifier that suits up to 100 square meter rooms. It has an adjustable 2 timer. 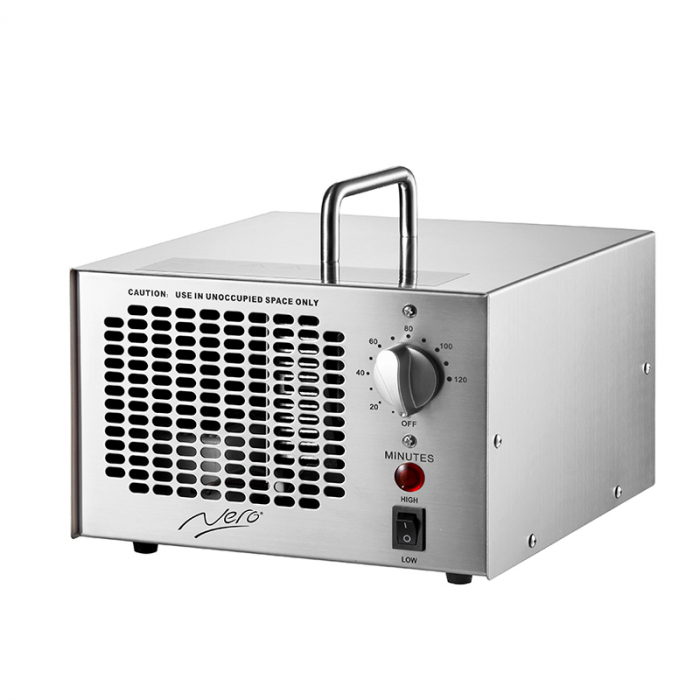 Nero 7G Ozone Machine Stainless Steel is a powerful air purifier that suits up to 140 square meter rooms. This ozone machine has an adjustable 2 hour timer. For use in unoccupied spaces. 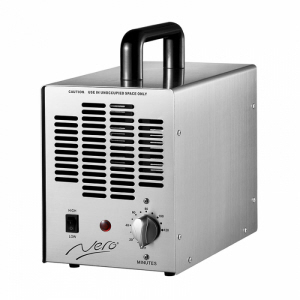 Nero 10G Ozone Machine Stainless Steel suits up to 160 square meter rooms. For use in unoccupied spaces. Long life ceramic ozone plates. The Whole Room Dryer is a highly efficient whole room dryer. 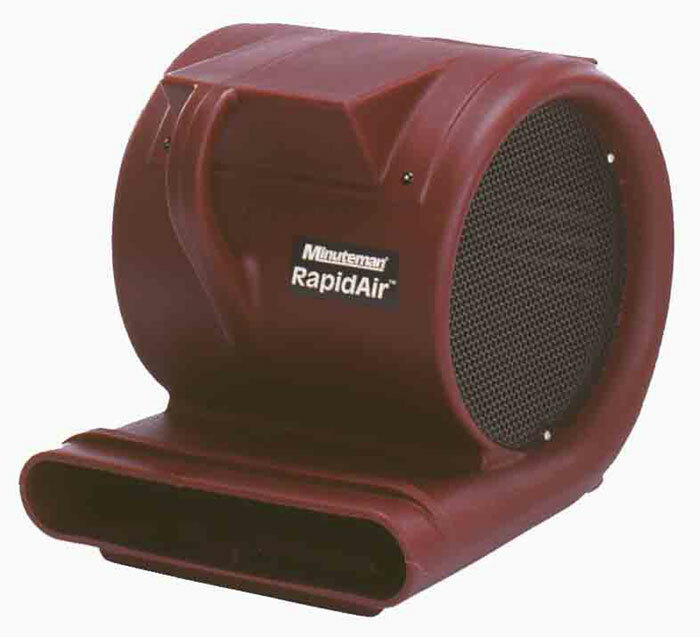 It s unique downdraft drying system pulls drier, warmer air from above driving it down and out across the entire surface of the carpet. This is aided by the heavy-duty castors which position the unit at optimum downdraft height. A single dryer can dry a typical office or room in as little as 15 minutes. 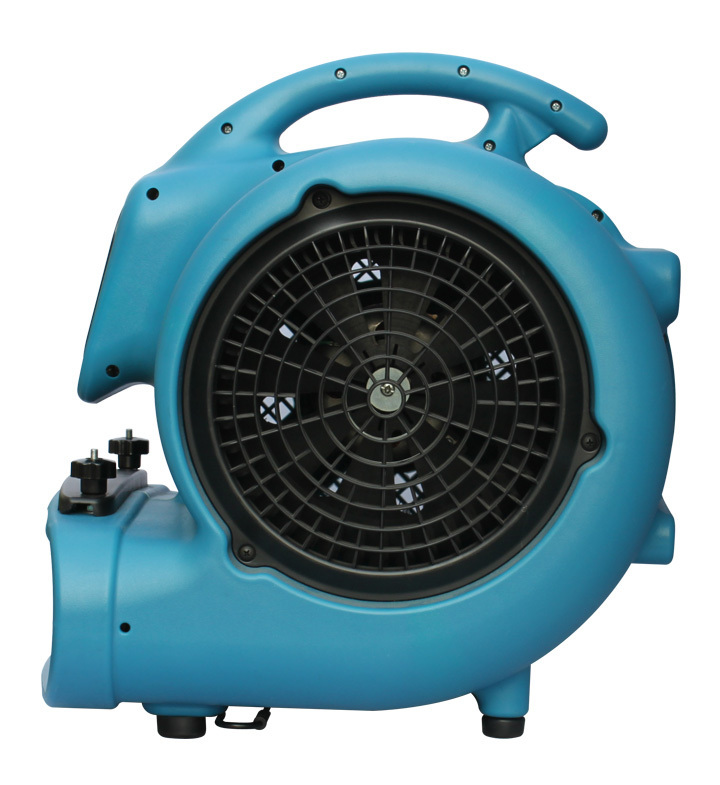 With 360º directed air flow it allows the entire room to be dried at once, no sections involved. It also has multi position versatility. 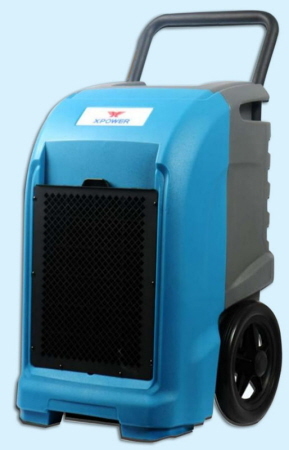 The whole room dryer has been designed to be stacked and has an inbuilt trolley, both of which enables ease of use when both storing and transporting. Minuteman Rapid Air is a 3 speed carpet dryer, dries carpets and floors in half the time. Powerful 1 HP motor. Three drying positions. 10 year warranty on the body. 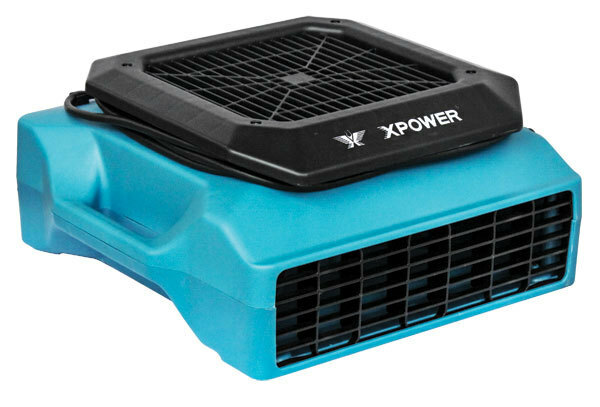 X Power X-41ATR Axial Air Remover brings you an axial fan never seen before, through state-of-the-art research and design; Xpower have brought a revolutionary series of fans to the industry that provides long-life operation, maintenance-free performance, high levels of efficiency, compact design and extremely low noise. Completely speed controllable, a first in the industry. 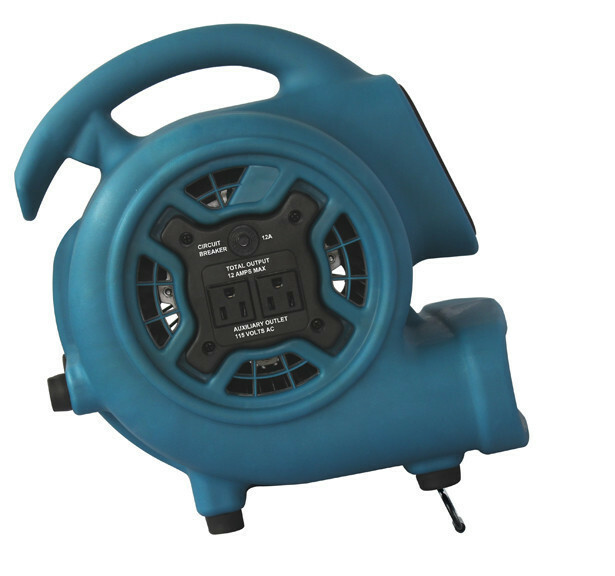 Also offers a high quality dual outlet for Daisy-Chaining and a 3 hour timer for ease of use in professional applications.﻿﻿ It is the perfect tool for creating large streams of air for drying or ventilation. 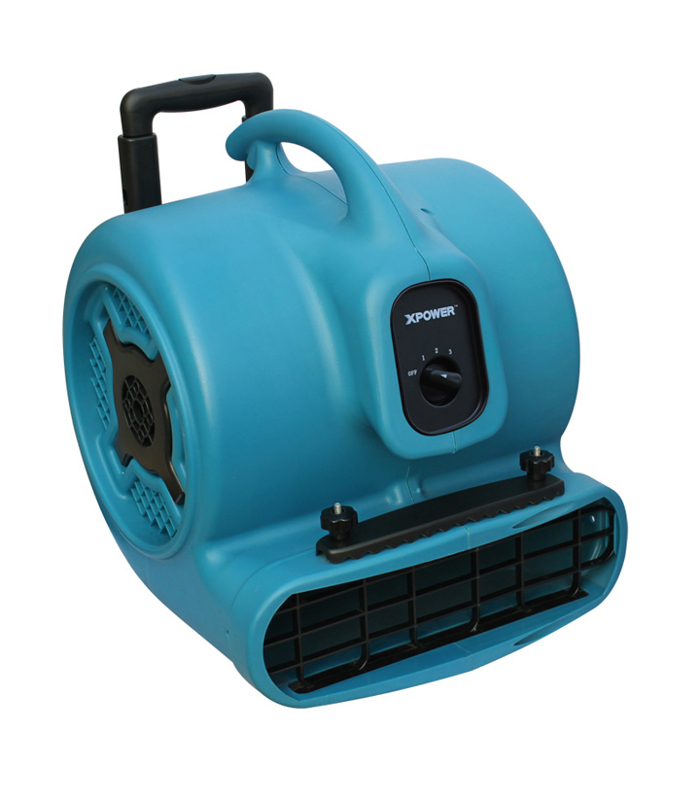 It creates a maximum airflow capacity of up to 3600 CFM while only drawing a low 2.4 amps of power. Baby-Sized, Huge Drying Power! P-230AT Mini Air Mover or Dryer weighs a mere 11.2 lbs. 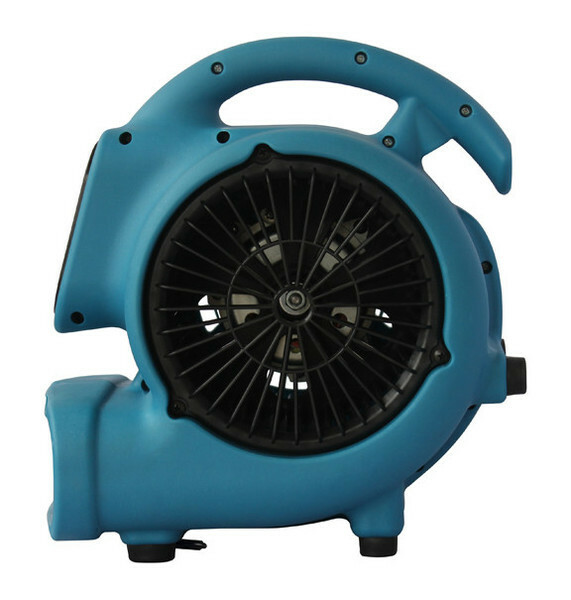 provides up to 800 CFM making it the perfect tool to tackle any job around the house. 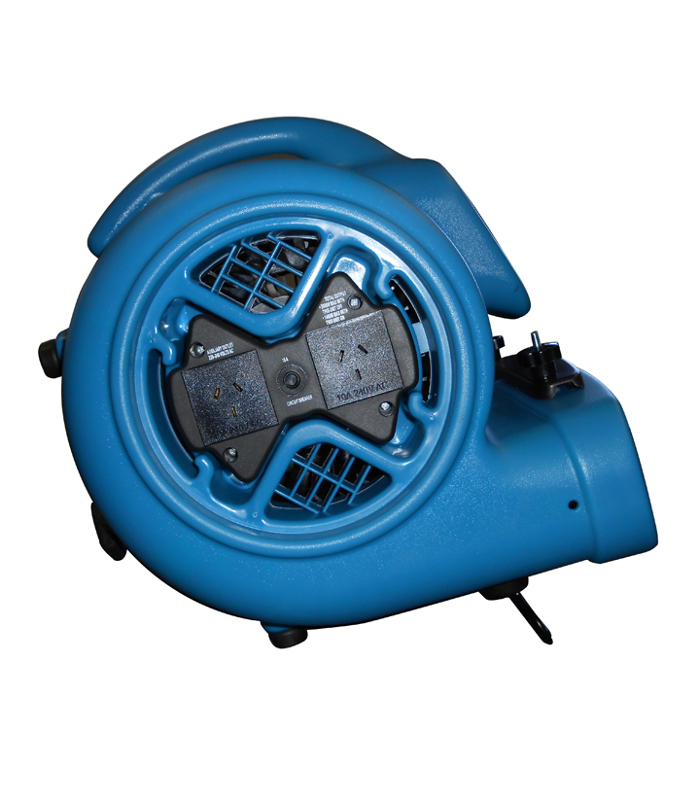 Powerful, extra quiet and energy efficient 1/5 HP motor. 3 speeds and 4 angle drying positions, including a swing-out kickstand. 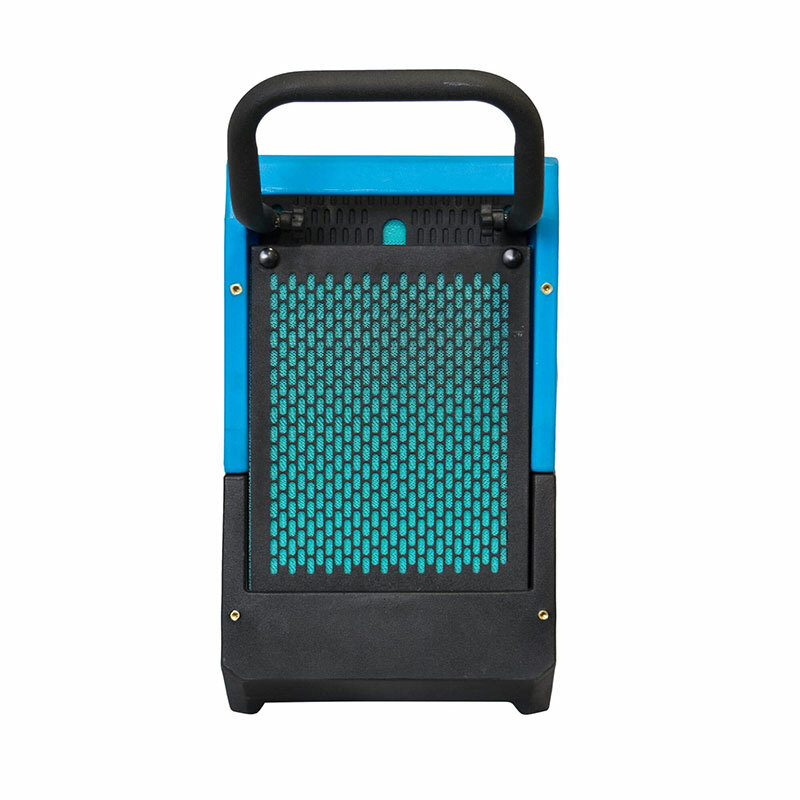 This light and compact unit can be carried up and down stairs with ease! It is perfect for water damage around the home. 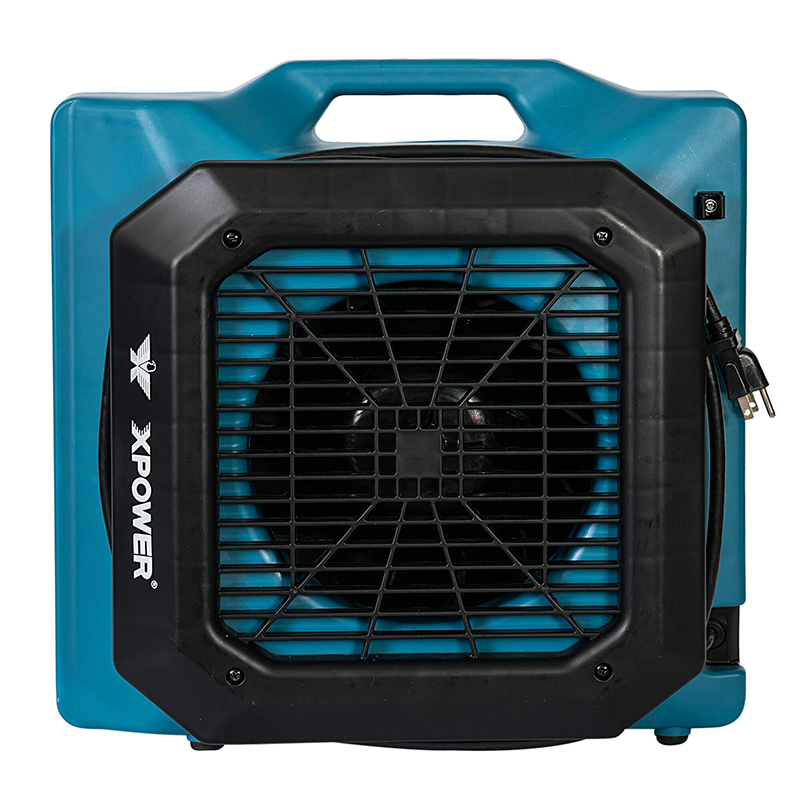 XPower X-400 1/2 HP Multipurpose Utility Air Mover a compact unit that is perfect for commercial and residential use. Stackable. Affordable and easy grip handle. 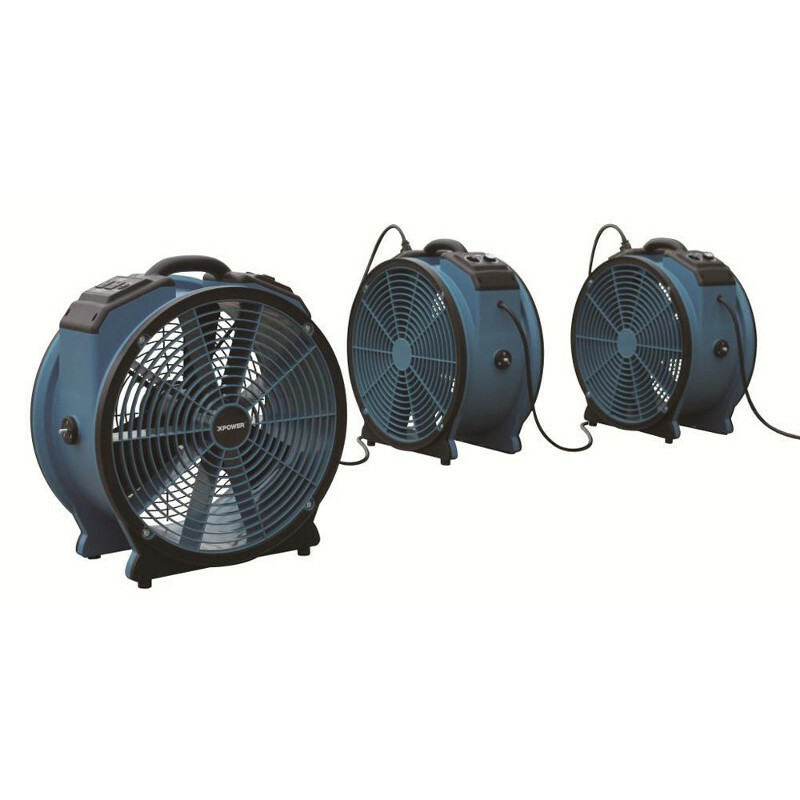 Powerful and energy-efficient motor works the fan at three different speeds. 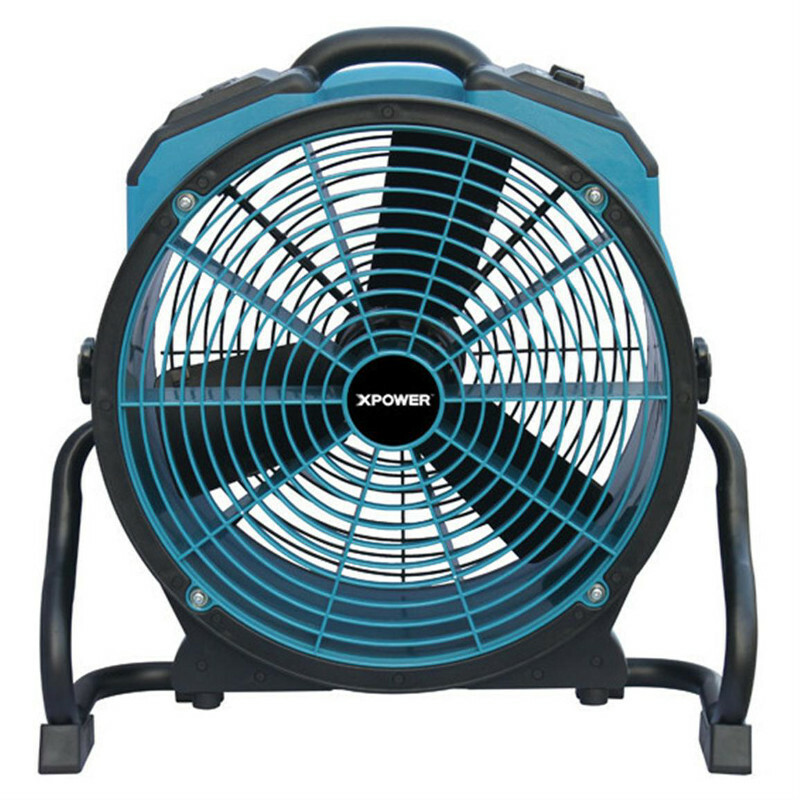 It’s great for outdoor jobs while still being a great choice to dry floors, circulate air, fix water damage, and do so much more. 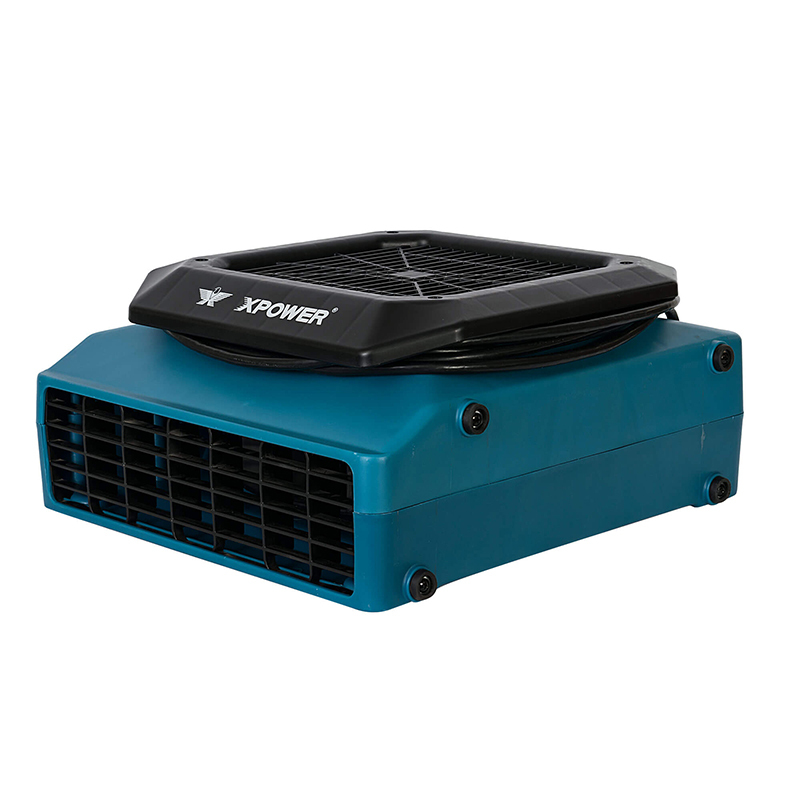 This air mover is meant to endure all of the elements and will provide you with years or service. 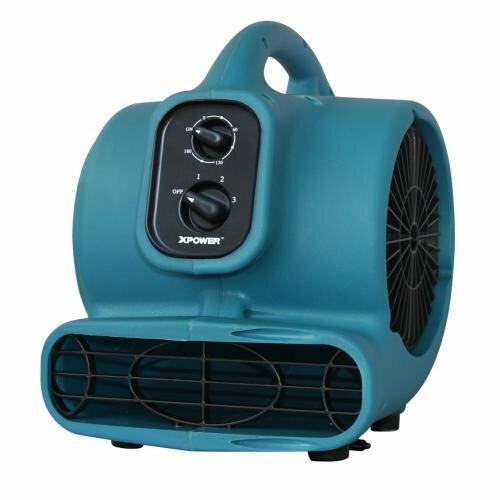 It is also great for outdoor use. 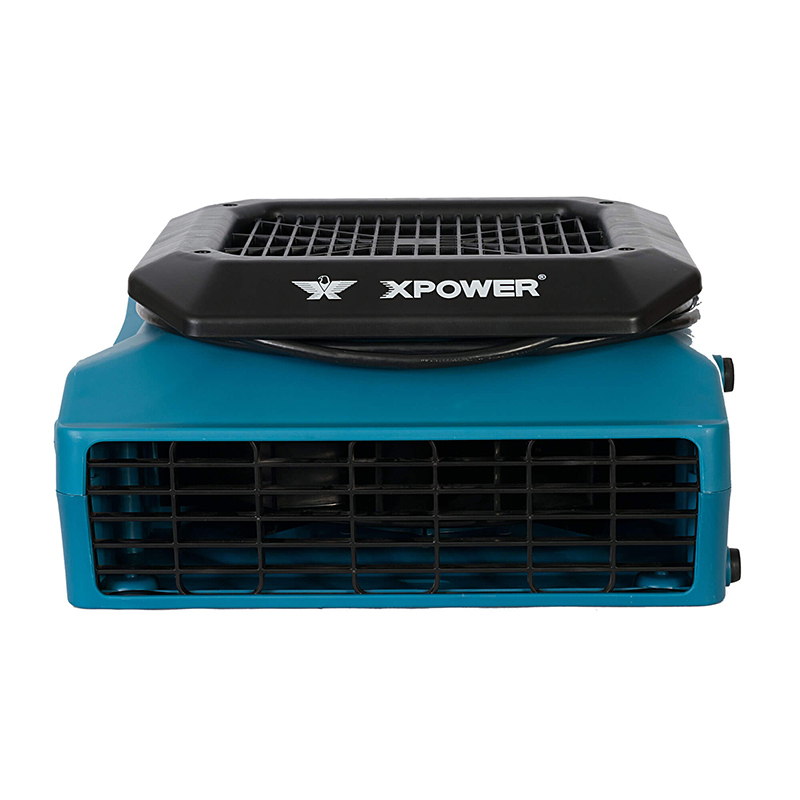 X-600-AC Professional Air Mover/Dryer is the most popular air mover for the USA Restoration Industry. 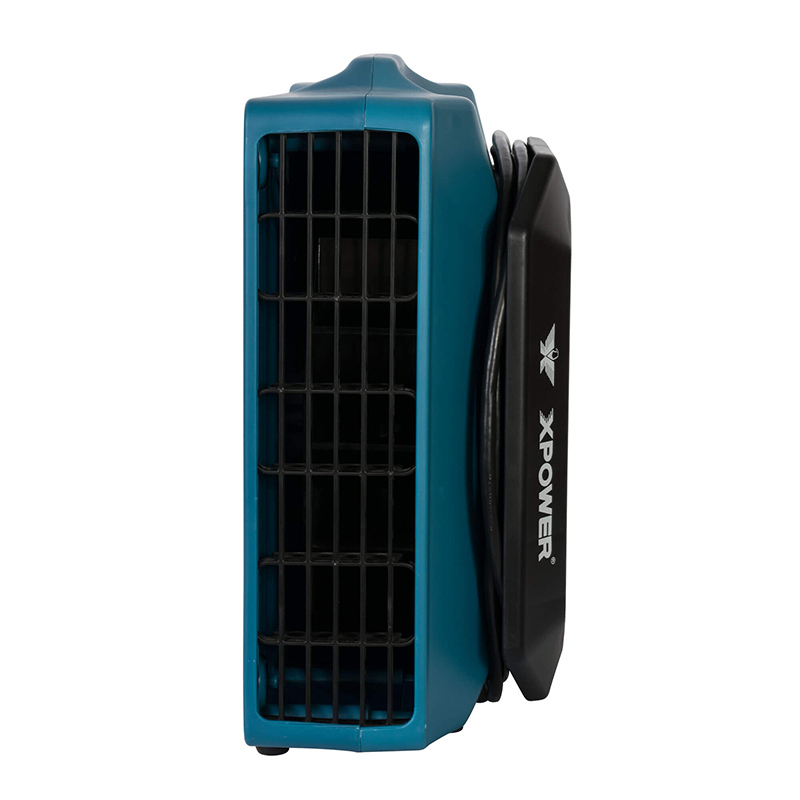 Using tough ABS Plastic, this is made to withstand the abuse of any environment. It has rug clamp and daisy chain power connection. 2400 Rated CFM. 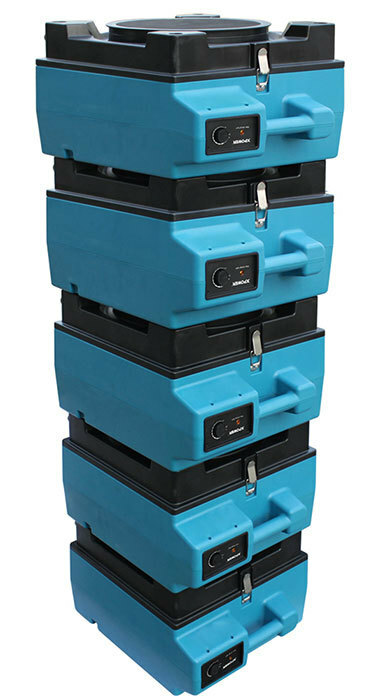 Stackable (up to 4 units). 3-spreed. 4 position usage. 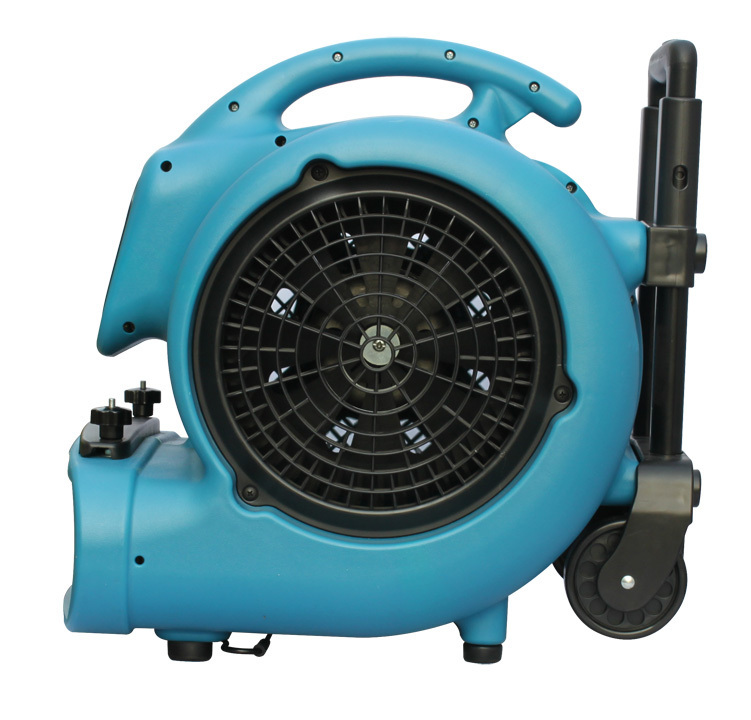 1 HP Multipurpose Air Mover Dryer. Tough ABS Plastic Housing. This powerful unit is Heavy Duty and designed to quickly and effectively dry your floors. 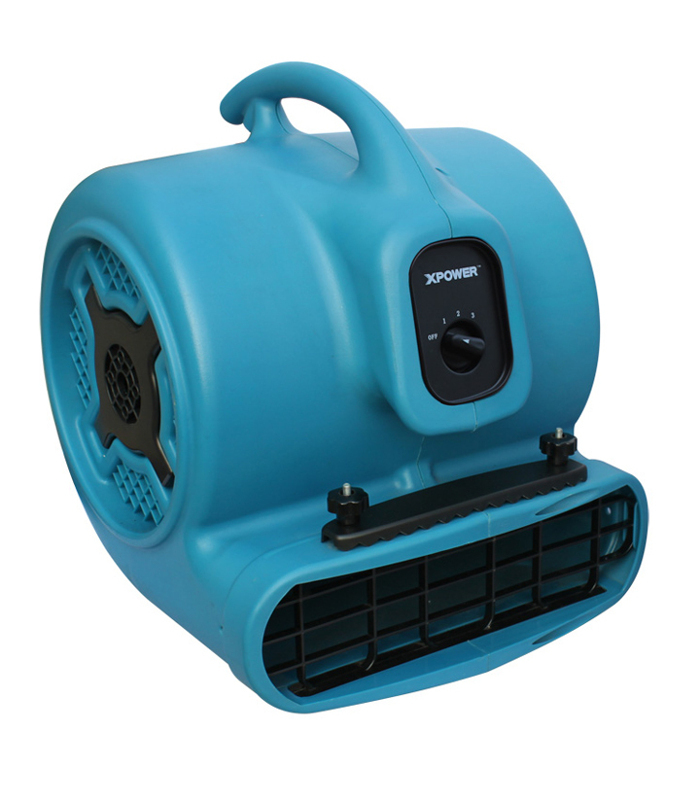 X-Power 1HP Multi-purpose Air Mover/Dryer with wheels and handle. Tough ABS Plastic Housing. 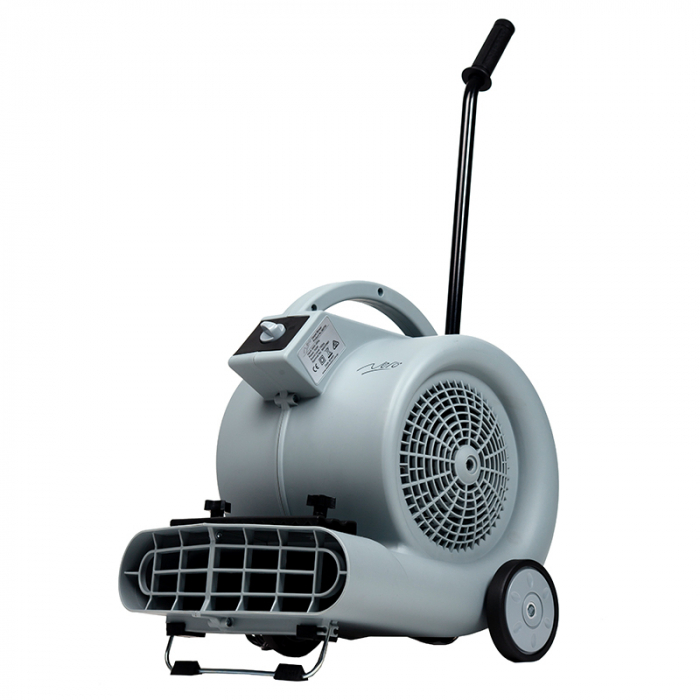 This powerful unit is Heavy Duty and designed to quickly and effectively dry your floors. Wheels & Handle are designed for easy mobility. 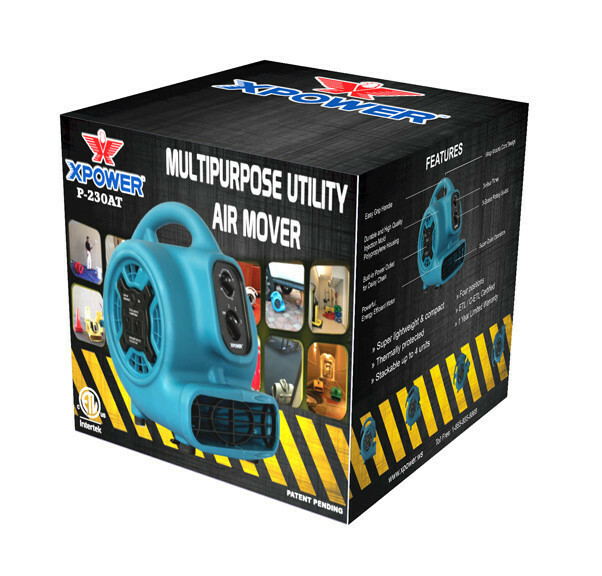 Multipurpose Air Mover/Dryer. Tough ABS Plastic Housing. 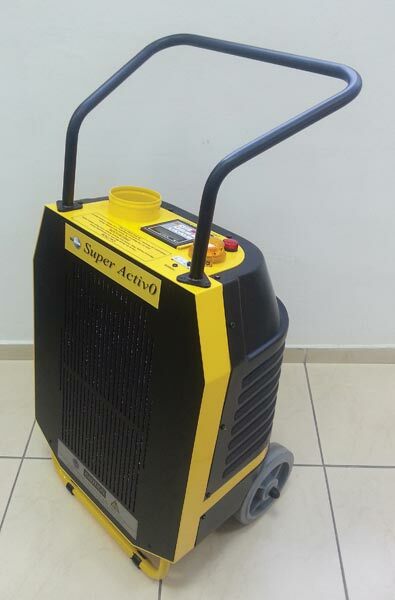 This powerful unit is Heavy Duty and designed to effectively and quickly dry your floors. It comes with wheels & handle for easy mobility. 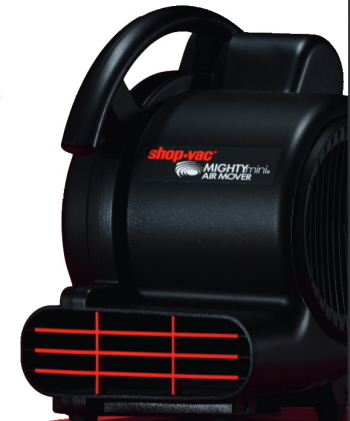 Shop Vac Mighty Mini Air Mover is designed to quickly dry wet carpets and floors, with a second and third position for drying walls and ceilings. 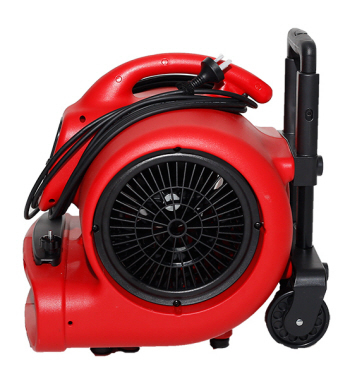 Three operating positions for drying carpets/floors, walls and ceilings. Three speed switch for better airflow control. Cord storage to keep cord untangled.